Trump envoy urges PA leaders to solve Gaza’s humanitarian situation and work towards peace with Israel. 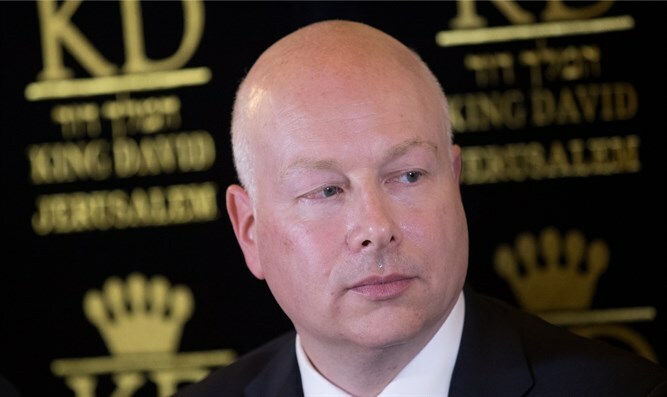 The U.S. special representative for international negotiations, Jason Greenblatt, on Thursday called on Gaza’s leaders to focus on solving the enclave’s humanitarian situation instead of on violent protests near the border with Israel. In a series of tweets, Greenblatt also called on the Palestinian Authority (PA) leadership to work towards peace. “Palestinians in Gaza have the right to protest their dire humanitarian circumstances. Organizers and leaders should focus on that message, not stoke the potential for more violence with firebombs and flaming kites, and must keep a safe distance from the border,” Greenblatt wrote in a series of tweets. “The cost of these demonstrations is too high in loss of life and injuries. This is why President Trump is willing to invest so much to forge peace. It is time to do the difficult work of negotiating a solution and work for peace. That difficult work includes reuniting Palestinians in Gaza and the West Bank under one responsible PA leadership,” he continued. “I agree and we must work together to try to reach a peaceful future for Israelis &and Palestinians. This will require brave deeds, commitment and compromise from all. Let’s work together to pave the way for a peace plan-which is only the very first step in the long road ahead,” concluded the American envoy. Tensions have been exacerbated on the Israel-Gaza border since the “March of the Return” processions began on March 30, in which Gazans march in large numbers toward the border with Israel and clash with Israeli security forces. The rioters have been using “terror kites” mounted with firebombs. The kites are flown over Israeli forces or look-out positions, at which point the firebombs are dropped. Palestinian Authority (PA) chairman Mahmoud Abbas last week welcomed the marches, claiming they are a means of “peaceful resistance”.